There are two chocolate cake recipes everyone should know. The first is Black Magic Cake, a dump in the bowl and mix cake that calls for a cup of buttermilk and hot coffee. The second is Hershey’s Perfectly Chocolate Cake, which is similar, but calls for an adjusted amount of leavening agents and regular milk instead of buttermilk. The reason I’m mentioning this is both cakes appeared on my radar this week. 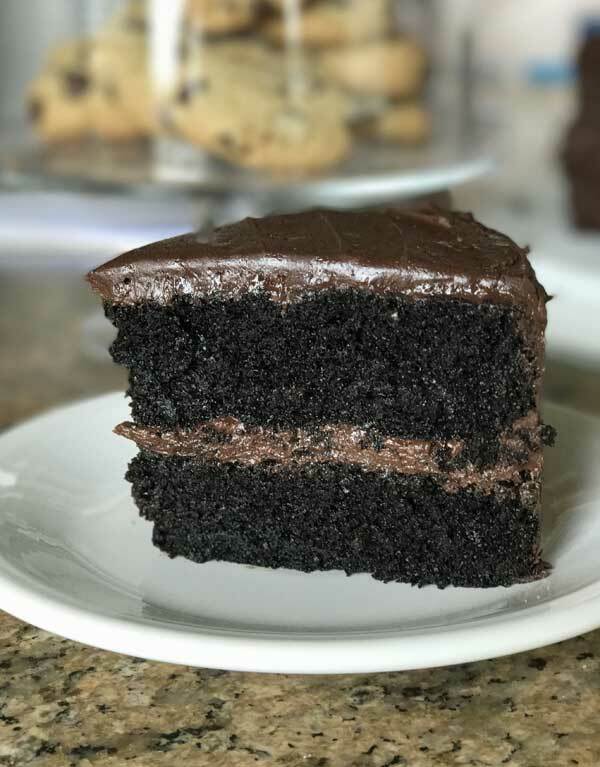 First, my sister-in-law sent me a link to Sally’s Baking Addiction where she calls Black Magic Cake the best cake in the world (she throws in some black cocoa). And recently, a lady in Pennsylvania used the Perfectly Chocolate recipe to make The Best Chocolate Cake in Pennsylvania. Hers calls for a rich peanut butter frosting and looks SO good. So here’s how I made the cake this week. I used the original recipe, but took out 2 tablespoons of the cocoa and substituted with 2 tablespoons of black. That step is totally unnecessary, but if you happen to have some black cocoa around, it adds flavor. I also used my all-time favorite frosting, but put in a little buttermilk to play off the buttermilk flavor in the cake. Enjoy! Black Magic Cake is a classic American cake recipe from Hershey's cocoa. 4 1/2 cups confectioners' sugar, sift or aerate before using. Preheat oven to 350°F. Grease 2 9-inch round cake pans and line with circles of wax paper or parchment. Grease again and dust with flour. In a large mixing bowl bowl, stir together flour, sugar, cocoa, baking powder, baking soda and salt. Make a well in the center and add eggs, oil, buttermilk and vanilla. With a heavy duty scraper, stir mixture, scraping up dry mixture from the bottom to ensure that it is incorporated. Add the hot coffee and stir until thick and well blended. With an electric mixer, beat on medium speed for about 30 seconds or until well blended. Divide evenly between 2 cake pans and bake on center rack for 35 minutes or until cakes spring back when touched. Allow the cakes to cool on a rack for about 15 minutes, then carefully invert and let cool completely. To make the frosting, combine the softened butter, half of the sugar and the cocoa powder in a large mixing bowl. Stir until mixed, it will be thick and pasty. Stir in the vanilla, then continue adding the sugar, stirring until it’s very thick. Add the buttermilk and stir, then continue adding milk and stirring, scraping bowl often, until it’s slightly creamy. Now begin beating, adding more milk as necessary, until it is smooth and creamy. Level the cake if you need to (though this one bakes up fairly evenly), then spread cakes with frosting and stack. Well, I’m glad you ask. For cake, I guess I like both, but I do love the drama of a dark cake so it’s fun to use the Hershey’s Dark once in a while. I also like other brands of Dutch that aren’t so dark. However, I really like natural cocoa as well. For frosting, I never use Hershey’s Dark. I like regular Hershey’s natural, Ghirardelli or Scharffen Berger natural. This cake looks rich and delicious!!! My sister in law makes the Hershey’s chocolate cake with the extra dark cocoa and it looks a bit like this. We all love it. Which do you prefer?